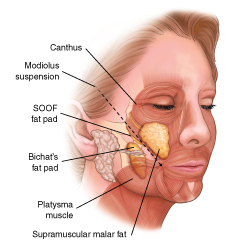 The buccal fat pad (fat pad of Bichat) is a deep pocket of fat below the malar eminence (cheek) and behind the buccinator muscle which can produce a more rounded and full face. Buccal fat pad excision can be performed to improve the definition of the face and narrow an excessively round face. While the procedure is subtle in its overall result, when performed correctly it can produce a more prominent depression below the cheek region. Caution must be exercised in removing too much of the fat pad as it can leave for a skeletonized appearance to the face, especially later in life. Through an incision in the mouth extending approximately 2-3cm, the buccinator muscle is separated with a clamp to gain access to the buccal fat pad. Fat is then gently extracted and removed to provide a “hollowing” effect of the cheek region. It is very common for patients to have an exaggerated appearance after the procedure and have the appearance of a chipmunk due to significant swelling. To minimize post operative swelling and the risk of seroma/hematoma formation (fluid accumulation), we recommend icing of the cheeks in the 48 hours after surgery. We also provide patients a prescription for antibiotics along with an oral rinse to minimize the risk of infection. Typically we recommend performing the procedure under some form of light sedation or anesthesia to allow for easier manipulation of the jaw and intra-oral structures.